Experience a truly unforgettable experience at the Hilton Dubai The Walk Hotel. 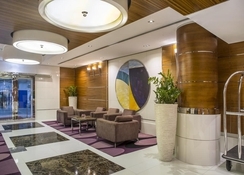 Located in the heart of Jumeirah Beach, the hotel offers scenic views of the Arabian Gulf. This 5-star hotel provides a wide range of family-friendly accommodations and has an impressive selection of restaurants – 12 to be specific. Take a refreshing dip in the swimming pool, which is temperature controlled all year, or share memorable experiences with your family at the hotel’s private beach. While you’re relaxing on the sand, hop into Wavebreaker, the hotel’s beachside bar bar which serves some of the most delicious beverages and finger food. Watch the sun set while sipping on delicious cocktails at the Pure Sky Lounge & Dining, which has a chic and modern ambience. The hotel offers a wide array of packages, which include – breakfast & Wi-Fi, bed & breakfast, and all-inclusive family packages, which ensure you have a good time, without leaving you broke. 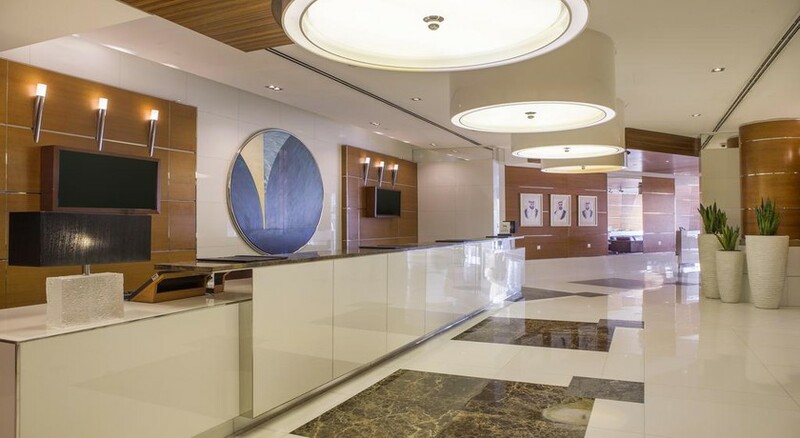 Located centrally in Dubai’s most energetic district – Jumeirah Beach Residence District, the Hilton Dubai The Walk Hotel serves as the hotspot for many tourist attractions such as street painting, art displays, sand sculptures, comedy shows, and booths selling fashion accessories. The Dubai International Airport is around 35km from the resort (40-minute drive), while Abu Dhabi International Airport is at a distance of 100km. The metro station is 10 minutes from the hotel, while the Mall of the Emirates and Ibn Battuta Mall are also nearby. Other entertainment centres such as the water park, the skiing centre and golf courses are just a short distance away. 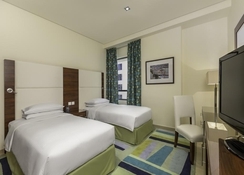 The hotel offers 362 fully furnished apartments, which come with kitchenettes and a range of modern amenities. They are divided into three basic categories: Guest Rooms, Suites and Executive Rooms. All the rooms have 24-hour room services, laundry services and king-sized beds. Suites come in two, three and four bedroom apartments, and Executive Rooms have a direct access to the Executive Lounge on the 35th floor. Some of the rooms offer amazing views of the Arabian Gulf. Hilton Dubai The Walk has an impressive list of restaurants, bars and lounges, each of which is dedicated to a particular type of cuisine. Start your breakfast with a lavish spread at Hartisan. As the day progresses, enjoy barbequed delicacies and drinks at the beachside. Savour imported cheese and wine at The Great Escape, feast on Mediterranean specialities at Crave, or sample authentic Italian dishes at Bice Ristorante. In addition, the Axis Lobby Lounge, Bice Sky Bar and Pure Sky Lounge & Dining are the hotel bars, which provide breath-taking views, and fabulous drinks during most hours of the day. Hilton Dubai the Walk has temperature-controlled pools and poolside bars, where guests can lounge and have a great time. The private beach of the Hilton Dubai The Walk hotel ensures a fun day out on the sands. For the more active visitors, there are opportunities for bowling, scuba diving and snorkelling. Kids can enjoy an activity-filled day at the games room, too, if you don’t fancy leaving the resort. 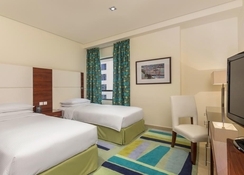 The hotel is close to Abu Dhabi’s exciting city centre, which provides various avenues of entertainment: from movie theatres to grand shopping malls, splash-tastic water parks and exhilarating desert safaris. My family and i were upgraded to a 3 bed apartment on the 21st floor. The apartment was the epitome of luxury, 3 bathrooms, a large lounge with dinning table for 6 and a balcony. There was a sea view from every window. The location was great for activities and had a lot of night life. I will definitely recommend it.